Starchild uses the language of sacred geometry to create interactive artworks that inspire, enable and empower. He is an emerging multi-disciplinary artist from Bondi, NSW, working in installation, new media, sculpture, painting, poetry and software. His interactive installations leverage three dimensional sacred geometric structure in order to create safe space for people in all phases of consciousness. In 2017 Nathan Starchild and his crew Gang Star Gazers, received a Black Rock City Honorarium Grant to build their interactive installation, Pleiadian Oasis, to create a safe space in the desert at Burning Man. Check out this article in the Wentworth Courier all about it. His code art involves interactive three dimensional explorations of higher dimensional forms. These have been deployed as live animations, Visual projections at gigs, interactive art games, and stand alone projections. Starchild’s paintings obsess over the geometry of life including sixfold rotational symmetry, the golden ratio and Fibonacci spiral, and dendritic patterns. 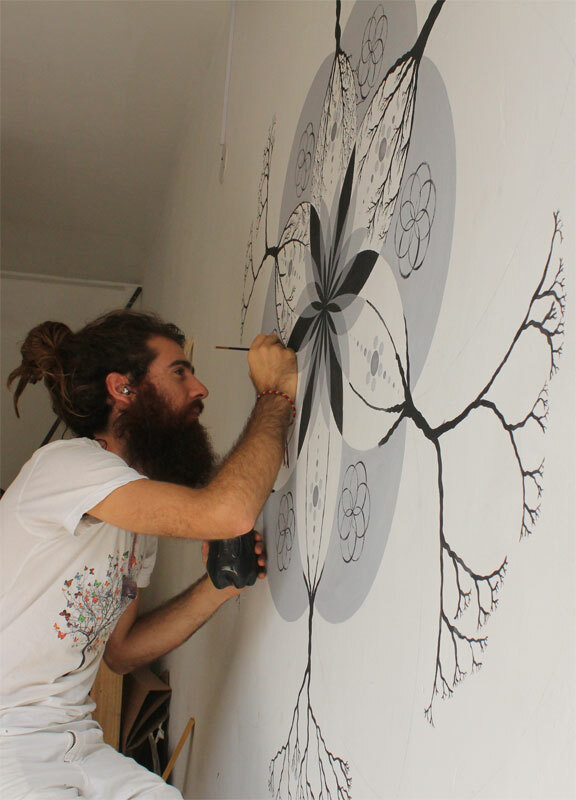 Working mostly in acrylics he paints his mandala-like kaleidoscopic forms on canvases and walls. However, by far his favourite surface to paint on is the human face! Part art object, part sacred ritual, part performance art, Face Paint Therapy is his favourite gig in the world.